Carbonless forms — also known as NCR business forms or multi-part forms, are an essential tool for business. Carbonless forms are produced by printing on multiple sheets (or plies) of carbonless paper that afterwards are collated and bound into sets. Carbonless paper has a uniquely treated coating on its surface that with manual or mechanical pressure, transfers an image from one ply to subsequent plies beneath it. Printing with Appvion’s NCR Paper®, we guarantee that the image will remain intense, clean and legible down to the last ply of your document. We’re a recognized market-leader when it comes to producing carbonless business forms and we’ve specialized in supplying carbonless forms to businesses for over 20 years. We print all sizes and types of carbonless forms and offer fully customizable options including full-colour and spot-colour PANTONE printing, custom graphic design and the typesetting of your specific business information. Ask us about environmentally-friendly carbonless forms. Will you require sequential numbering on each form? Will you require durable wrap around covers around a group of sets? Have you considered using security paper or an eco-friendly alternative? Want more information on carbonless forms printing? Upload files for carbonless forms printing. A member of our sales team will be in contact with you regarding your files. Request a quote for carbonless forms printing. A member of our sales team will be in contact with you regarding your request. 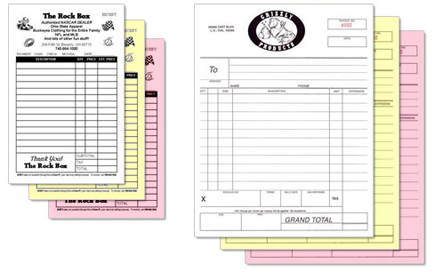 Contact us for more information about our carbonless forms printing services. Our carbonless forms are printed on Appvion NCR Paper. With NCR Paper*, images remain intense, clean and legible down to the last ply for easy readability throughout the life of the document.